While cruising Pinterest last night, I came across the lovely photos above and was instantly captured by the emerald green velvet sofas. The strong black elements and shades of gray and lavender give the rooms an aura of sophistication and romance. Colorful and nontraditional, green sofas combined with shades of blue create a calm yet eclectic interior. A strategic throw pillow in an unexpected pattern breaks up the ocean hues and transitions coastal chic to quirky in a flash. Looking to counter stark white walls with a punch of color? You could be ordinary and buy a bright lamp or even add art. Or, you could just sit down a beautifully designed olive sofa in the center of the room and call it a day. And last, but certainly not least, I'll leave you with my favorites of this series. Both designs were clearly done by someone who knows the interiors industry. Statement rugs, eye catching coffee tables and high style side chairs balance bring the sofas in to the designs rather than setting them apart. Green looks so good in a home, I want to do a wall like this in our home. Wouldn't it be wonderful to see the big boy furniture stores (I'm looking at you Crate and Barrel) offer such sumptuous colors as standard choices? I'm sage-ed and oatmeal-ed out. I love colored sofas! I've got my eye on an orange one right now!! I LOVE the tufted couches!! I've always wanted one, and I'm thinking emerald green!!! The last coffee table is insane, also digging the green sofa!!! Love it!Everything is so beautiful!Love especially the first two pictures!AMAZING! 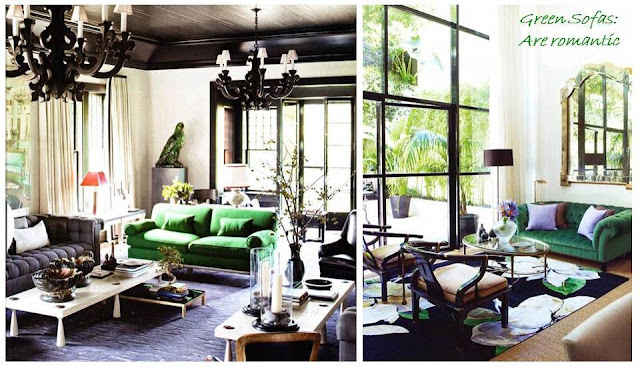 Green sofas...so unexpected...love these! My fave is that last room...the green sofa paired with that white shag rug is amazing! I love statement pieces... furniture included! Really love the velvet green! Love these rooms, so cool. The lime green! Melts me heart with how well it pulls everything together in the most unexpected way. -glad to have run across your blog.. very fun! I love that you feature interior design on your blog. I never would have thought a green couch could be styled elegant and minimally. These pictures are great. I started following you too. Keep in touch. I love all of these room and the sofas are amazing. I found out this year when decorating my dorm room that green is a nice easy and calm color to decorate a room with!